TORONTO, Dec. 16, 2015 /CNW/ - Multi-Health Systems Inc. (MHS), an international leading publisher of scientifically validated assessments, announced today the acquisition of leadership development company, Discovery Learning Inc. (DLI). With stakeholders in multiple sectors including corporate, clinical and education, MHS now adds DLI's expertise in leadership and organizational development to its continuously growing specialties. "Today's announcement marks the success of MHS growth and adaptation to the changing needs of our clients and the modern day workforce," said Hazel Wheldon, President & COO, MHS. "We are a company focused on innovation and are excited to have DLI join MHS." "When you think innovation, think MHS, said Steven J. Stein, CEO, MHS. "It's as important as ever to grow as a digital and globally driven company focused on innovation and we are excited to have DLI's expertise in leadership development and change management as part of MHS." The acquisition brings together MHS's expertise in a variety of areas including emotional intelligence and personality with DLI's focus on leadership and change management. "We have developed world class resources in the areas of executive and organization development", said Chris Musselwhite, DLI Founder and President. "This acquisition will significantly broaden the reach and impact of our products." 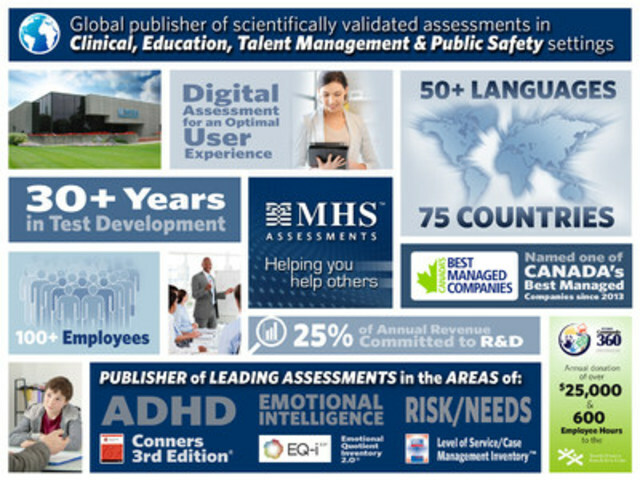 With MHS products sold in more than 75 countries and translated into over 50 languages, individuals and organizations can now capture the benefits of an increased array of assessments. MHS has been named one of Canada's Best Managed Companies since 2013. The best managed designation is a recognized symbol of excellence for Canadian businesses. Every year hundreds of companies compete for this designation in a rigorous and independent process that evaluates their management skills and practices. For more information about MHS, please visit www.mhs.com. Discovery Learning, Inc., a leadership development company in Greensboro, North Carolina, provides leadership, organizational development products and training to some of the world's largest and most well-known organizations including Amazon and the Center for Creative Leadership. DLI's mission is to work collaboratively with clients to build healthy and sustainable organizations through the development of effective leaders. For more information about DLI, please visit www.discoverylearning.com. Revised at December 16, 2015 at 12:45p.m.